Injuries, wear and tear, soft tissue abnormalities and poor posture are all common causes of neck and shoulder pain. There are a number of exercises outlined in this article that you can do to avoid neck and shoulder pain by keeping these areas of your body strong and healthy. If you have a preexisting medical condition involving your shoulders, neck, or spine, check with your doctor before trying them. Being free from neck and shoulder pain is not something you may give a lot of thought to. However, during times that your neck or shoulder is experiencing pain or stiffness, you may wish you had done something to prevent it. Here are the posture and exercise tips. 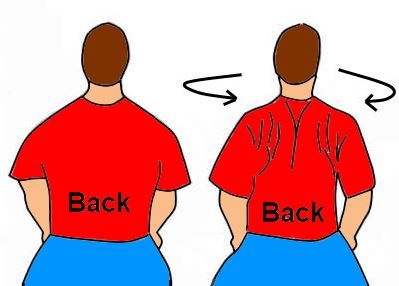 Forward head and shoulder posture is described by sitting in a position where your neck is slanted forward, causing your head to be in front of your shoulders. It is the number one cause of neck and shoulder pain. When sitting, be sure to maintain a straight posture where your feet are flat on the floor, your lower back is supported and your shoulders are relaxed. Don’t slouch or slant your head forward. It is also important to take short breaks a few times each hour to stand, stretch or change positions. Your computer screen should be placed about an arm’s length in front of you with the top directly level with your eyes. Place a stand under it if it is not high enough, or lower it if it is too high. 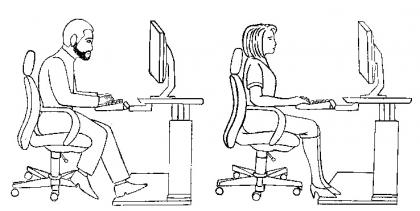 This will help you to avoid needing to bend your neck and will help prevent neck and shoulder pain due to computer use. Your keyboard should be placed about 4-6 inches, or 100-150 mm, in from the edge of your desk to create an area to rest your wrists on. Keep your wrists straight when typing and also keep your keyboard in front of you. Your elbows should be kept below your shoulders and beside you. A wrist pad can also help to keep your wrists level and straight. Your mouse should be kept close to you and can be used with a mouse pad to help keep your wrist from bending uncomfortably. Move your keyboard out of the way when you are not using it so you can pull your mouse closer to you to avoid shoulder pain from mouse use. In order to help avoid neck and shoulder pain when driving, position the car seat to an upright position so that your lower back and head are supported. 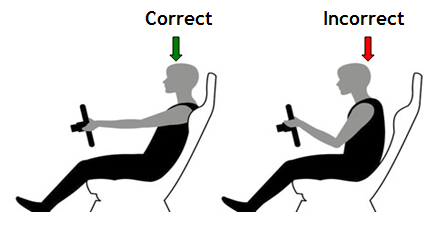 Adjust your seat so that your arms are comfortable and so that you do not need to reach for the steering wheel. If you frequently use the telephone, avoid cradling it on your shoulder. Try using a speakerphone or headset. From a sitting position, relax your neck and shoulders and raise your arms while bending them at a 90 degree angle. Contract the muscles between your shoulder blades while keeping your neck and arms still. This action will draw your shoulder blades closer to each other. Repeat this exercise 5 times. The shoulder blade pull works by strengthening your neck muscles in the front and stretching the muscles below your skull in the back. It is a good way to help repair damage as a result of improper posture. While in a standing position, put your arms out straight in front of you. Either put your palms together or the back of your hands together, whichever you find to be more comfortable. From the upper back, bend over as if you were about to dive into the water. Bend your head to that you chin is lying on your chest. This exercise is good for stretching both your upper back and neck muscles. This exercise can be done while standing or sitting. Turn your head as far to the left as you can while remaining comfortable. Hold the position for 10-30 seconds. Then turn to the right and hold. This is a good exercise to do in order to strengthen your neck muscles and enhance the range of motion of your neck. While lying on your back, bend your knees and place your feet flat on the floor. Lift your head to your chest while keeping your shoulders on the floor. Then lie on one side. Lift your head up to the side. Change to your other side and repeat. Finally, lie on your stomach and move your head back and up. This is a good way to avoid neck and shoulder pain or treat existing discomfort. While standing, place one foot forward and the other one back. Bend down so that the knee in front is positioned above your ankle. Put your hands together behind your back and lift your chest up. Fall forward over the thigh of the leg in front, keeping your hands together behind you. Look down and keep your spine straight. Squeeze your shoulder blades tougher. Hold the position for 30 - 60 seconds. Repeat on the other side. This is good exercise to help alleviate pain in your neck and shoulders and to help it from occurring in the first place. While sitting, shrug your shoulders until they reach your ears and hold for 2 or 3 seconds. While continuing to shrug, rotate your shoulders backward. Repeat this exercise 10 times, relaxing in between. This stretching exercise is effective in relaxing your neck and shoulders. While standing, widen your feet so that they are past your hips on each side. Turn the toes on one of your feet out and the toes on your other foot in. Position your arms out straight in front of you, level with your shoulders. Shift your torso towards the side where your toes are pointed out until it is parallel with the floor. Place the arm on that side at your knee with the other one straight up. Hold for 30 to 60 seconds then switch sides. This exercise helps to ease tension in your shoulders and neck.